It was the man in the bear suit who won it: Mark Wallinger, 48, has been awarded this year's Turner prize, 12 years after his first nomination, when he lost out to Damien Hirst. His film Sleeper, 154 minutes of footage of the artist wandering around a deserted German gallery disguised as a bear (but recognisable by his very particular gait), has baffled and entranced visitors to the Turner prize exhibition by turns. The prize was officially given, in fact, not for Sleeper, but for State Britain, his meticulous re-creation of peace campaigner Brian Haw's anti-war protest in Parliament Square. The work was praised by the judges for its "immediacy, visceral intensity and historic importance" combining "a bold political statement with art's ability to articulate fundamental human truths". The £25,000 prize was awarded tonight at a ceremony at Tate Liverpool - the first time the prize has been based outside London in its 23-year history - by actor, director and Easy Rider star, Dennis Hopper. Wallinger was the bookies' and art world favourite to win in an uneven contest that saw two fairly senior artists - Wallinger and Mike Nelson, who has also been nominated before, in 2001 - pitched against photographer and film-maker Zarina Bhimji and Glasgow-based sculptor Nathan Coley. State Britain, on show between January and September 2007 at Tate Britain's Duveen Galleries in London, was by far the most overtly political work in contention for the prize. In it, Wallinger remade Haw's famous peace camp, precise in every detail: from the tea-making area to the numerous banners, flags, photographs and posters amassed by Haw and his supporters. It took 14 people six months to source the materials and carefully weather and age them to a state of complete authenticity in Wallinger's studio in London. It cost him around £90,000 to make, and the commission paid £3,000, so in a curious irony the £25,000 Turner prize money will help him recoup at least a fraction of the cost of making the work, which is currently in storage. 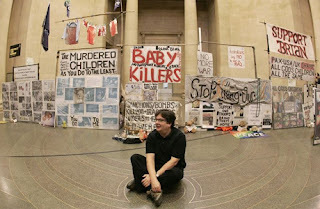 The work had particular piquancy as Haw's protest, which had begun in June 2001, was largely dismantled on May 23 2006, following the passing by parliament of the Serious Organised Crime and Police Act that forbade unauthorised demonstrations within a kilometre of Parliament Square. That exclusion zone, taken literally, bisected Tate Britain, and part of Wallinger's installation fell within its border. Wallinger's best-known work to date is perhaps his Ecce Homo, a statue of Christ that occupied Trafalgar Square's fourth plinth in London in 1999. Other memorable works include Angel, in which Wallinger ascended and descended the escalator at Angel Underground station, London, reciting parts of the Bible, backwards. For the Turner prize exhibition at Tate Liverpool he chose Sleeper, first seen at the 2005 Venice Biennale. There was some controversy about his decision to show a single work filmed in 2004, rather than create a new piece for the exhibition: but Sleeper has never been seen before in the UK. 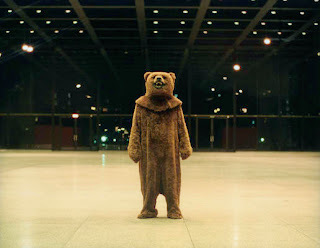 The film shows Wallinger, dressed in a bear suit, wandering around in a darkened space in the Neue Nationalgalerie, Berlin. Filmed on three cameras during the night of October 16 2004, it is a funny, perplexing and oddly affecting piece. Sometimes the bear disappears. Sometimes it paces around. Sometimes it leaps out and frightens passers-by in the streets outside. Wallinger made multiple references in the work: the bear is the symbol of Berlin, but he also alluded to the city's cold war past and the history of "sleeper" spies. Wallinger was born in 1959 in Chigwell, Essex, the son of a fishmonger who later worked in life insurance. He studied at Chelsea School of Art and later at Goldsmiths, and continues to lives in London. He has said: "I think art needs to engage the viewer and has to have a hook that isn't entirely cerebral... I like Velázquez, Manet, Warhol - realists that held up a mirror to their society that was radical, but not pedantic." The prize is awarded for the best exhibition given by a British or Britain-based artist in the 12 months preceding the May nominations: the judging is not officially based on the Turner prize exhibition itself, which is simply meant to show a sample of each artist's work to the public. Each of the shortlisted artists receives £5,000. Zarina Bhimji showed photographs taken in East Africa and India, and a film, Waiting, shot in a sisal factory. Nathan Coley showed sculpture including his piece made from light bulbs mounted on scaffolding, originally seen on Mount Stuart on the Isle of Bute, with the words: "There will be no miracles here" picked out in light. Mike Nelson showed an intricate new installation, a labyrinthine set of rooms with peepholes hewn out of the walls. Viewers can peek through to what look like miraculous desert landscapes beyond. This year's panel of judges was writer Michael Bracewell, gallery director Fiona Bradley, curator Thelma Golden and writer Miranda Sawyer. The chair was Christoph Grunenberg, director of Tate Liverpool, taking over that position from Tate director Sir Nicholas Serota, who usually commands the proceedings. The Turner Prize exhibition continues at Tate Liverpool until January 13 2008. A retrospective of the previous prizes is at Tate Britain, London, until January 6 2008.